Christmas is just around the corner! Have you finished shopping for your loved ones? Sometimes, during the stress of the holidays we tend to forget about ourselves. Is there something under the tree just for YOU? Like myself, probably not. Here is your chance to win something to go under your tree for either yourself or a loved one that you still need to cross out on the list. CSN Stores had recently contacted me to host a fantastic and generous giveaway with a choice of one of the great products below. Did you know that CSN provides over 200 websites to shop for the perfect products and/or gifts? That's right, over 200! See for yourself by clicking this link to view a list of the websites offered. I promise that you will not be disappointed with the amount and quality of products to choose from. Wine Racks, Baby & Kids, Cookware, Shoes and much, much more! In the near future, you can read a review on one of their Cookware products that I have chosen to work with. The customer service department has been a pleasure to deal with. The winner will have a choice of one of these product's. Designed to complement Nautica's Arctic White Dinnerware Collection, Frost Block exhibits the same patterning on glassware. Quadrants or blocks of transparent glass alternate with frosted to give a subtle yet distinctly contemporary look. Especially suited for Arctic White dinnerware, The frosted panels add a pleasing sense of texture and help secure a grip on a wet glass. 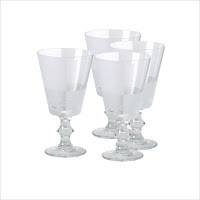 The graceful stem on Frost Block Set of 4 Goblet Glasses adds elegance to any table setting - from casual to formal. The substantial base is perfectly weighted to balance a full glass of your favorite cool beverage. Soft, all natural cotton abloom with a sea of sweet blossoms, this delicately embroidered pattern is a modern update on eco-friendly style. Excite your dinner guests by bringing these vibrant, fun, contemporary-shaped stoneware bakers to the table. Whether it be a roasted chicken or classic mac n' cheese, food has never looked and tasted so fabulous. Want to know more about ordering from CSN Stores? Visit CSN today and bookmark my blog for an upcoming review. It's not too late to order Christmas gifts! One winner will be given the choice of ONE of the following gifts pictured and described above. You may enter this giveaway daily! MANDATORY ENTRY: This must be done or your entries will not count. Please leave a separate comment for each entry you complete. Winner will be chosen and contacted by email. You must reply within ASAP with your shipping address or another winner will be chosen. Once shipping information has been received, I will then contact the sponsor with your information so that they can mail out your prize. If you do not contact me with your information as soon as possible, the prize may not make it in time for the holidays. If you fail to contact me within 48 hours, a new winner will be chosen. I have not and will not be paid for this giveaway. This company will be sending a product sample for my evaluation and honest review. I would choose the pans. These would make a great gift for my older sister. She is always cooking something or the other, and not enough pans. signed up for csn deals by email. I would choose the adorable owl pillow. It would look super cute on my couch. I would love the glasses! Seeing as we really only have plastic glasses now it would be great to have some adult stemware! Merry Christmas to you and yours, from me and mine. I'd like the Nautica Home Frost Block Set of 4 Goblet Glasses for my daughter. I would choose the Rachael Ray Bubble and Brown set for my daughter. She's recently moved into her own place and can use any kind of cookware. I would choose the Rachel Ray set for my mom who is need of some new baking pans. I would like to win the Nautica Home Frost Block Set of 4 Goblet Glasses... they would be for my boyfriend. His place is definitely lacking! I would choose the Bubble 'n Brown set, for myself. I need some new casserole bakers. I'd like to win the Rachael Ray “Bubble & Brown” 2-Piece Stoneware Baker Set in Blue. it's hard to choose between the pillow and the bakeware... hmmm probably the pillow because I don't have one nearly as cute as that one! 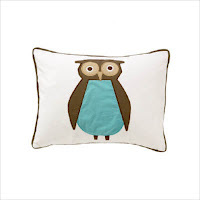 I would Choose The DwellStudio Owls Boudoir Pillow in Sky for My son! I would choose the Rachael Ray pans. I would choose the DwellStudios Owl Pillow for my niece! My sister would love to have the Rachael Ray “Bubble & Brown” 2-Piece Stoneware Baker Set in Blue. I would choose the Rachael Ray Bubble and Brown set for my daughter-in-law who loves to cook. Thanks for the giveaway. I would choose Rachael Ray “Bubble & Brown” 2-Piece Stoneware Baker Set in Blue for my brother and his wife as they are lacking in the kitchen department! I'd choose the Rachel Ray Bubble and Brown 2-piece Stoneware Baker Set for my twin sister... she recently just got her own place and could use a few things. Its the first time in 26 years that we haven't lived together. Thanks for the chance and Happy Holidays! I'd choose the DwellStudio Owls Boudoir Pillow in Sky for myself. The Owl pillow is adorable. I collect them. Thanks for the chance. I would choose the Rachael Ray “Bubble & Brown” 2-Piece Stoneware Baker Set in Blue - I would keep this one for myself! I would pick the Rachael Ray “Bubble & Brown” 2-Piece Stoneware Baker Set in Blue for me. the baking pans for myself cuz they're pretty. I would choose the goblets for myself so I could paint little flowers on them! I'd totally choose the blue bakeware for my mom--she has a blue and white kitchen and these would be awesome! I would choose the Rachel Ray Bubble and Brown Set for my oldest daughter as she just got married last weekend. I would choose the pans. These would make a great gift for my older sister. I'd choose the Bubble & Brown set for my girlfriend because she's a great cook. I would choose the Rachael Ray “Bubble & Brown” 2-Piece Stoneware Baker Set in Blue for myself. Thanks. I'd get the Rachael Ray “Bubble & Brown” 2-Piece Stoneware Baker Set in Blue for mt son who loves to cook. I would choose the Rachael Ray “Bubble & Brown” 2-Piece Stoneware Baker Set in Blue. It would be for myself! My sister loves the Rachael Ray “Bubble & Brown” 2-Piece Stoneware Baker Set in Blue. Please accept my entry. Thank you. I like the goblets and I would keep them for myself! I would choose the rachel ray bakeware set for me! I love her stuff! The baeware set would be a great gift for my wife. My son would love the Rachael Ray “Bubble & Brown” 2-Piece Stoneware Baker Set in Blue. He's a good cook. I would love the Rachael Ray “Bubble & Brown” 2-Piece Stoneware Baker Set in Blue. The goblets for my father, he drinks craft beer. I would choose the Nautica Home Frost Block Set of 4 Goblet Glasses. It would be for my Mom. She has the worst wine glasses. I would keep the beautiful Nautica Home Frost Block Set of 4 Goblet Glasses. I would get the Nautica Home Frost Block Set of 4 Goblet Glasses to replace my Mom's ugly ones. I would get the sweet owl pillow for my mom, she collects them. I would choose the Rachael Ray baking dishes and keep them for myself because they would be very useful to me. I'd choose the owl pillow. My cousin loves owls and would get a kick out of this! I would choose the bubble and brown pans for my newlywed sister. Definately the Rachael Ray stoneware. I don't have any thing like this and the color is "me"; and that's who its for "me". The Rachael Ray “Bubble & Brown” 2-Piece Stoneware Baker Set in Blue would be great for my son's kitchen. I would choose the Rachel Ray Bubble abd Brown pans. I would choose the owl pillow for my friend Esti! I would love the bakeware set in blue! i want the bakeware for myself! I would love the Rachel Ray baker set! I would love the Rachel Ray Bubble & Browns. I would keep one and give the other to my new daughter-in-law. Thank you! I'd pick the 2-Piece Stoneware Baker Set for myself. I would be selfish and keep the rachel ray set for myself! I'd choose the owl pillow for my best friend, who loves owls! i'd pick the Nautica Home Frost Block Set of 4 Goblet Glasses for my mom, thanks! I would choose DwellStudio Owls Boudoir Pillow in Sky for my daughter. I signed up for the CSN deals by email. I'd pick the pillow for my daughter. 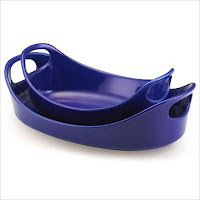 I would love the Rachael Ray “Bubble & Brown” 2-Piece Stoneware Baker Set in Blue. Thanks! I'd choose the pans and they would be for me, since they are already on my Christmas list. I would pick the Rachael Ray “Bubble & Brown” 2-Piece Stoneware Baker Set in Blue and keep it as a gift for myself. I love baking and cooking. Rachael Ray “Bubble & Brown” 2-Piece Stoneware Baker Set in Blue and I'd keep it for me, selfish, I know, but I need them. I follow your blog on google friends connect. i follow @mrsmiki77 & @CSNstores on twitter - js22222222 . The Rachael Ray “Bubble & Brown” 2-Piece Stoneware Baker Set in Blue would be great for my son. I would choose the *Rachael Ray “Bubble & Brown” 2-Piece Stoneware Baker Set in Blue and it would be for me because I've recently developed a love for cooking and have no good pans, bakeware, etc.! I would choose the Rachel Ray baking set for myself! I need them badly! I would pick the Bubble & Brown set for my sister because she is getting married next year. I would love the glasses,we do not have a lot that matches! !So these would be for ME! The Rachel Ray blue dishes would be for me because I cook for 7 every day and this would be wonderful! I would like the Rachael Ray Bubble & Brown 2-Piece Stoneware Baker Set for myself. I love cooking and Racheal Ray has great merch. I would choose the Rachael Ray “Bubble & Brown” 2-Piece Stoneware Baker Set in Blue for myself because I love cooking. I would choose the goblets for my daughter. The Owl Pillow has my heart but the Rachael Ray “Bubble & Brown” 2-Piece Stoneware Baker Set in Blue is my practical brain's choice. I would choose Rachael Ray “Bubble & Brown” 2-Piece Stoneware Baker Set in Blue for my sister.